This term we are going to be learning the names of the letters. As we now know all the sounds of the letters which is important for decoding words, we are now starting to look at capital letters and the sounds they make when we come across them in sentences. We have started to look at reading simple sentences, focussing on the capital letter at the beginning as this is linking closely with our focus on writing sentences. We look at flash cards with the capital and lower case letter and say ‘The S that says s’. 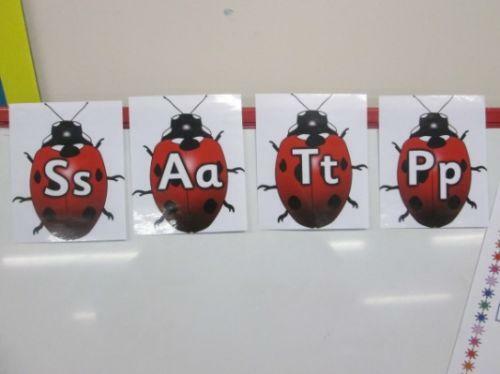 We are going back to the starting order that we learnt the sounds so this week we have learnt ‘S’ ‘A’ ‘T’ and ‘P’. We have started to learn the alphabet song using Floppy’s Phonics which is a slightly different version to the usual ABC as it helps with the difficult ‘L M N O P’ part that can sometimes be difficult to get our mouths to say quickly! Ask the children if they are able to sing it to you at home. This term we are focussing even more on writing and encouraging the children to start attempting to use their sound knowledge to write words. A lot of writing modelling has been done during the phonics sessions to show the children where the capital letters appear and we have also talked about the importance of a full stop. Using the Bug Club programme, we have looked at the difference of captions and sentences by noticing the features of a sentence e.g. capital letter, full stop, more words that give us some information. As part of our writing this week we have been preparing tickets for our flight by writing the name of our chosen destination on the ticket. We have also singed our passports with our names and wrote a luggage label for our baggage. This week we have revised counting in 2’s and have started to learn how to count in 10’s. The children are enjoying learning new ways of counting. We are looking forward to continuing this topic and if there is anything at home that you would like to share from a family tradition or your religion, it would be lovely to see different things e.g. clothing or perhaps try different foods. Please let Mrs Turrall know if you would like to come in and share anything or send your child with things (that are not precious!) for us to look at. Many thanks.